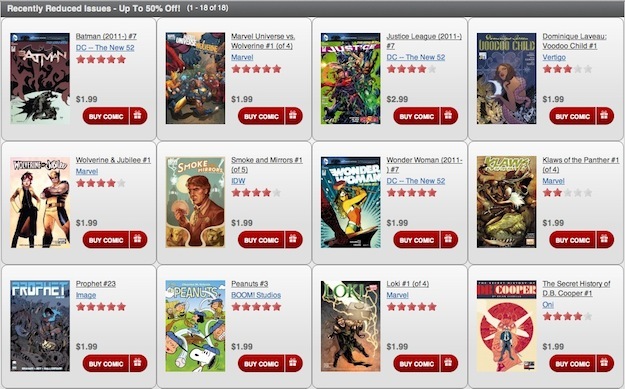 Nice to see a way to search for the best deals on the Comixology website now! If you’re like many Robot 6 commenters—heck, like me—and you don’t like paying full print price for a digital comic, here’s some good news: ComiXology has just made tracking price reductions easier with its Recently Reduced Issues section. We all know that Marvel, DC, and the other publishers sell their comics for top dollar when they first come out and then drop the price, but who can be bothered keeping track? Now you don’t have to. This week’s newly sanely priced comics include some of DC’s New 52 #7s, Marvel Universe vs. Wolverine #1, Peanuts and Steed & Peel from BOOM! Studios, and the first ish of Oni’s oddball The Secret History of D.B. Cooper. The topic of price drops came up when I talked to comiXology CEO David Steinberger last January, and he told me that DC routinely reduces prices of their new books a month after they go on sale. When I asked if sales go up that day, he answered, “Not as much as much as you might expect, but sure.” Highlighting the the price reductions is a smart idea; it may help bump sales from more frugal readers, while those who are paying top dollar to get their new comics on release day are unlikely to start holding off just because the discounts are easier to find. via New section highlights price drops at comiXology | Robot 6 @ Comic Book Resources – Covering Comic Book News and Entertainment. downthetubes Mobile Comics: Zombies go Digital!